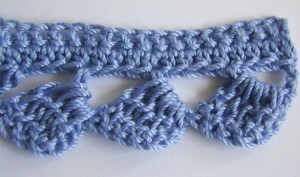 Start with a row of single crochet. 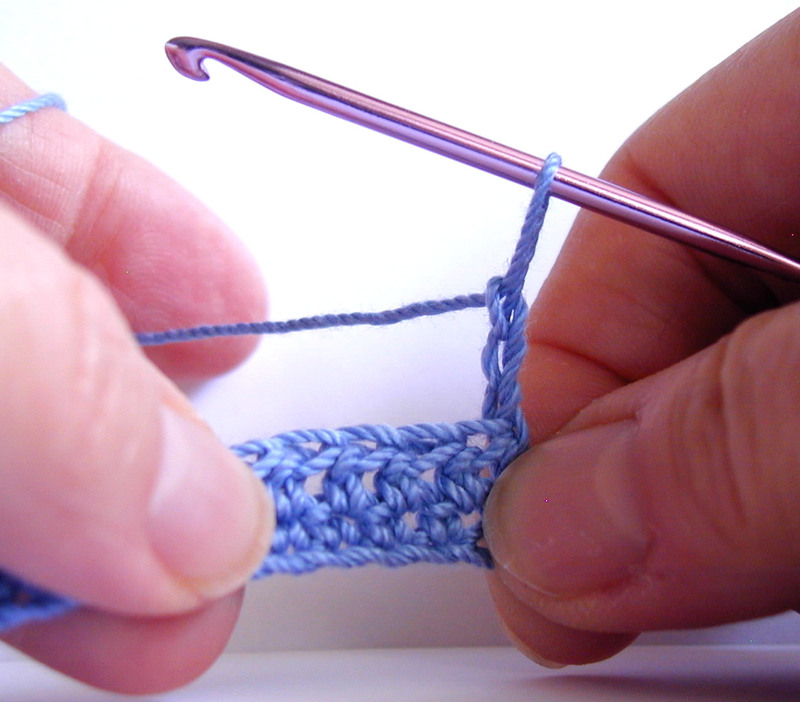 In this tutorial, I am using crochet thread size 3 with a D crochet hook. Skip first 3 stitches. 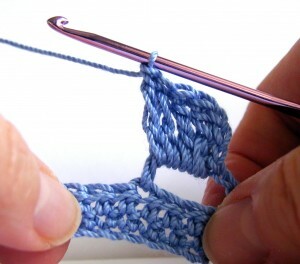 Make a tr (triple crochet) in the next stitch. 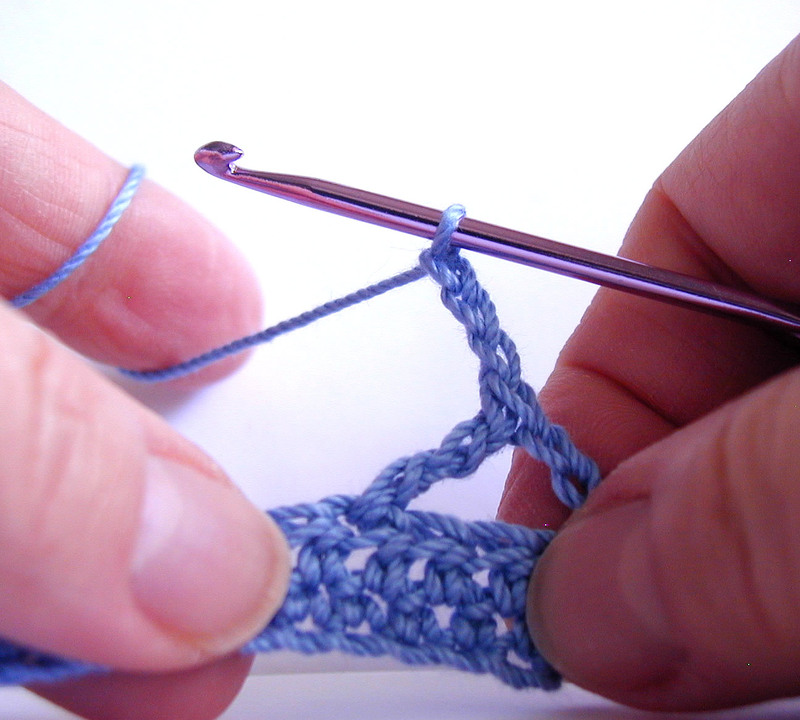 Make 4 triple crochet (tr) around stem of previous triple crochet (tr). Now you have a total of 5 triple crochet made. Your first block is now complete. Skip 3 stitches and repeat. This entry was posted on Saturday, March 5th, 2011 at 1:21 PM by Robin Beers	and is filed under Tutorials and Help. You can follow any responses to this entry through the RSS 2.0 feed. You can leave a response, or trackback from your own site. I love it! Thank you for sharing this project. This is fantastic. I do have a question for you! I once saw a pattern that looked like block edging in rows…with the blocks going in alternating directions. Does that make sense? Do you know what I’m talking about (because I don’t think I do 😀 ) and what it’s called? Thanks for your help! I just wanted to say thank you for your tutorials! I am a relatively new crocheter, last 2 years,so your site has helped me immensely. 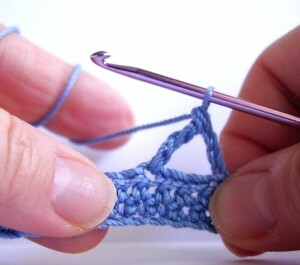 I have a better understanding of the stitches because of your site. Your step by step pictures are what helped me. It makes it easier to understand what the stitch should look like when you have the words as well as the picture to back it up. So thank you, thank you, thank you!!! You have a wonderful site! Looks great! I will have to try it out on one of my many projects one of these days. hi Kelly Rachel, love this beautiful edging and love the cotton that is used. wish that i could get all the beautiful crochet cotton and yarn in my country. Thank you for your crochet site. Is there any way to reverse this stitch? I am edging a ripple afghan and want the stitch to be normal going up the first side of a ripple and then a shell at the point and then reverse the stitch going back down the other side of the ripple. Please advise as to how this can be accomplished, thanks. How do you finish this off? I’m using this edging around a flannel baby blanket (I LOVE it, btw) and want to know how to finish it once I get all the way around the blanket? Is it okay to substitute “4 tr around the stem of prev tr” with “4 dc around the stem of prev tr” ?? Hi Celina, you’re sure welcomed to try it! I haven’t done it that way before but please let us know how it goes. I really, really like this edging!! Is there a way of doing this into the open boxes of the filet pattern without having to make the entire border first? Hi Robin, sure you can crochet the border evenly around your item. Just follow the steps in the tutorial. The photos show the border being done on a row of stitches, but you can do the border on the side of your item. I would love to do this edging around a pr of pillow cases putting my first row of sc base directly into the case material. Can you tell me if that row should end in an even or odd number of sc. Really love your patterns and the tutorials are top notch. Thanks for your help with my dilemna. 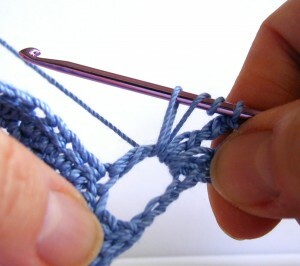 Hi Lori, the number of single crochets you’ll need should be a multiple of 4, since the “skip 3 stitches, tr in next stitch” uses up 4 stitches. So if you take the total number of single crochets you make and divide it by 4 and get an whole number, you should be good to go! WOW thanks for a fast response…I am anxious to get them started and will get them going tonight after dinner. Thanks again Rachel. Thank you so much for your tutorials! Im new at crocheting, having taught myself by book and youtube. Your directions are so clear and easily followed. Thank you again! Hi Beverly, you can chain any multiple of 4. So that’s 4, 8, 12, 16, 20, 24, etc. This beginning chain wouldn’t include the chain 3 that’s at the very beginning so you would have to add that. Thank you so much for this post, just used it on a baby blanket and it looks wonderful! Looking forward to finding more ideas from you! Once you get all the way around the afghan, you can join the end to the beginning by making a slip stitch into the ch 3 that is next to the set of treble stitches. Then cut your yarn and weave it in. Hi Rachel, thanks for the free pattern, interesting edging indeed ! 🙂 I have a hard time doing the corner, any tips ? Hello! When you get to a corner, try putting a treble crochet stitch (the beginning of a block) into the corner stitch and working the block stitch like you normally would. When you go to make your next block, instead of skipping 3 stitches, make the next treble stitch (the beginning of the next block) into the same corner stitch that you make your previous block into. 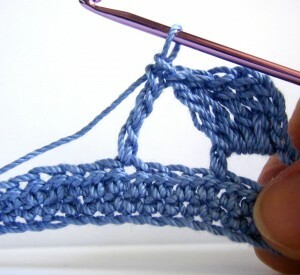 That way you’ll have more than 1 block stitch in your corner, which will create a better turn.